Nothing allows you to control how your users access the Internet like the TP-LINK Wireless-N router. It transmits and receives data at up to 300 Mbps, and it operates on the 2.4-GHz band. It features browser-based management, allowing you to control the router remotely using the Web. You can set individual bandwidth for each IP address, and you can enable or disable security at the touch of a button. 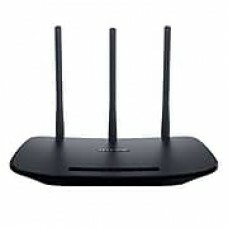 Three antennas increase the router's functionality by enabling it to pick up signals from multiple directions.